When an artist takes a camera underwater, the photos are markedly different from those we are accustomed to. Karen Glaser’s new color work presents a world where light is filtered through suspended particles into a dreamy atmosphere of subdued colors and willowy forms yielding to the ebb and flow of unseen currents. 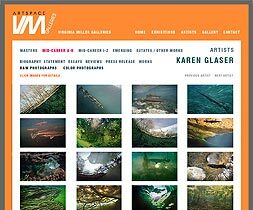 Glaser’s black-and-white photos, such as those in her monumental 226-foot mural at the Port of Miami, tend to be more dramatic, with moving fish and sea creatures captured in dynamic compositions.